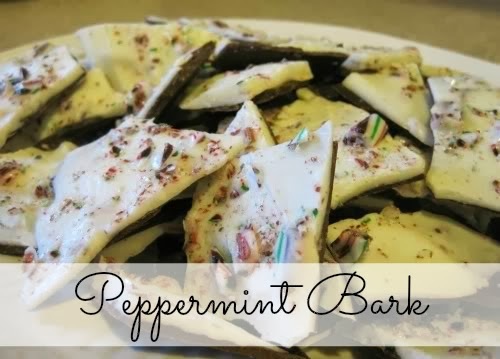 Today I’m going to show y'all how to make cheap and easy peppermint bark! 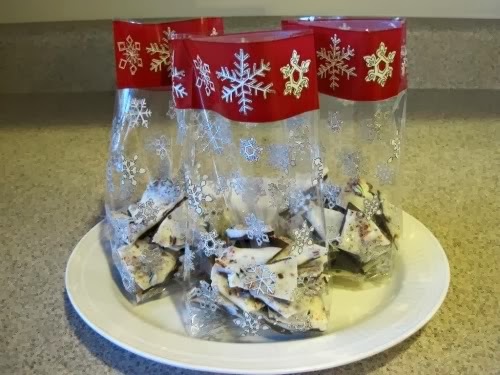 I originally shared this recipe two years ago at Type A Decorating as part of her 25 Days of Christmas Guest Bloggers. It’s been a couple years, so I decided to re-post the recipe here for easy reference. 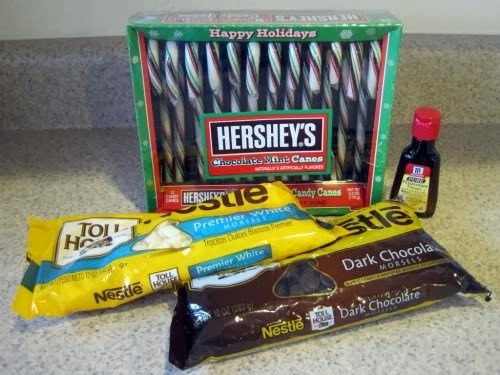 *Note: I used Hersey’s Chocolate Mint Canes because I think the green on the candy canes makes the bark look prettier, but it’s totally up to you. Unwrap the candy canes and place in a plastic bag. 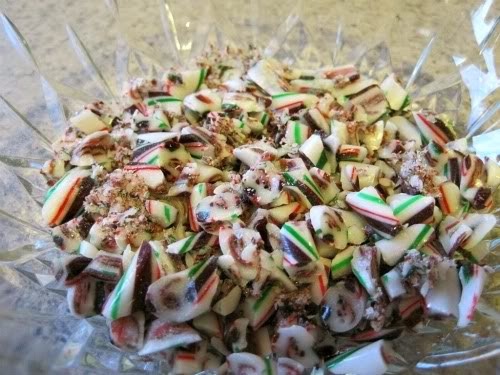 Use a hammer (or anything heavy) to break candy canes into small pieces. Cover a cookie sheet with parchment or waxed paper (I used waxed paper). 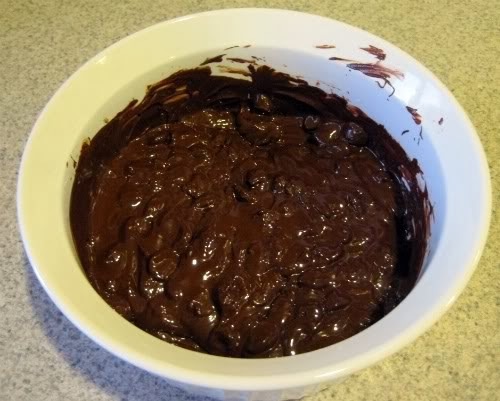 Empty all of the dark chocolate chips into a large bowl. Microwave for 30 seconds, then stir. Repeat process until the chocolate is melted. It should take about 90 seconds of cooking time. Stir in the peppermint extract. Pour the chocolate onto the prepared cookie sheet. Use the back of a spoon or rubber spatula to spread the chocolate to an even thickness, about an 1/8”. And don’t panic or feel rushed, you’ll have plenty of time to spread the chocolate out. Place the cookie sheet in the refrigerator for about 25-30 minutes. The chocolate needs to be firm before you add the next layer or it’ll smear into the white chocolate. 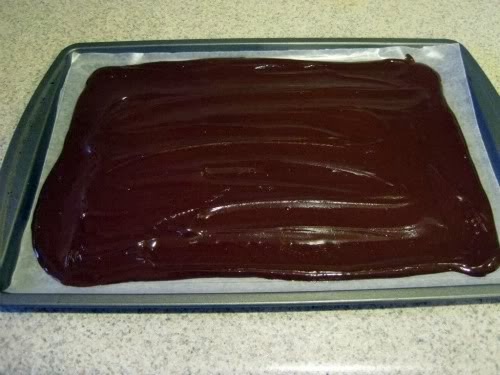 Once the dark chocolate is firm you can begin on the next layer. 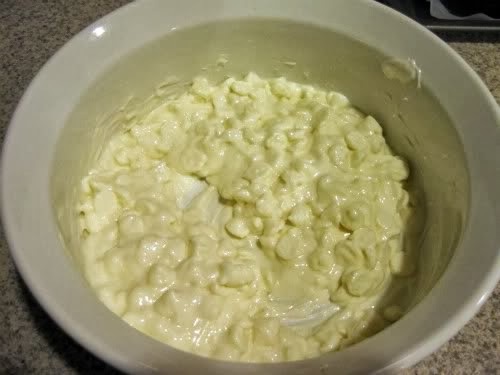 Empty all of the white chocolate chips into a large bowl. Microwave for 30 seconds, then stir. Repeat process until the chocolate is melted. It should take about 90 seconds of cooking time. 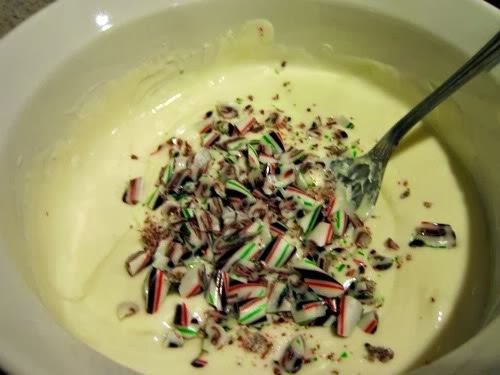 Stir in about half of the candy cane bits. Try to add only the pieces and not the “dust”. 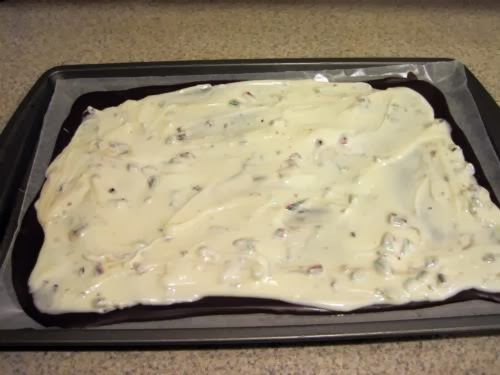 Remove the cookie sheet from the refrigerator and pour the white chocolate on top of the dark chocolate. Spread the white chocolate carefully and evenly over the dark chocolate. Don’t worry if it doesn’t cover the entire dark chocolate layer. 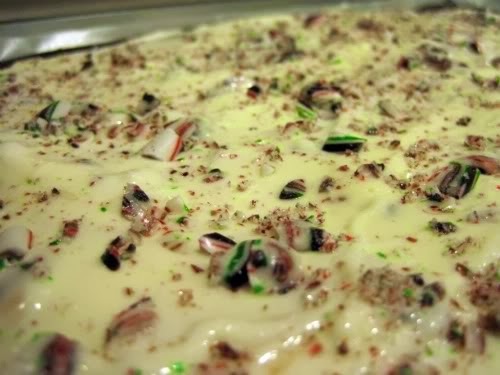 Sprinkle the remaining candy cane bits (and dust) over the entire white chocolate layer. Place the cookie sheet back in the refrigerator for about 45 minutes or until firm. Remove the cookie sheet from the refrigerator. Using your hands, break the chocolate into small pieces. Congrats! You now have peppermint bark! 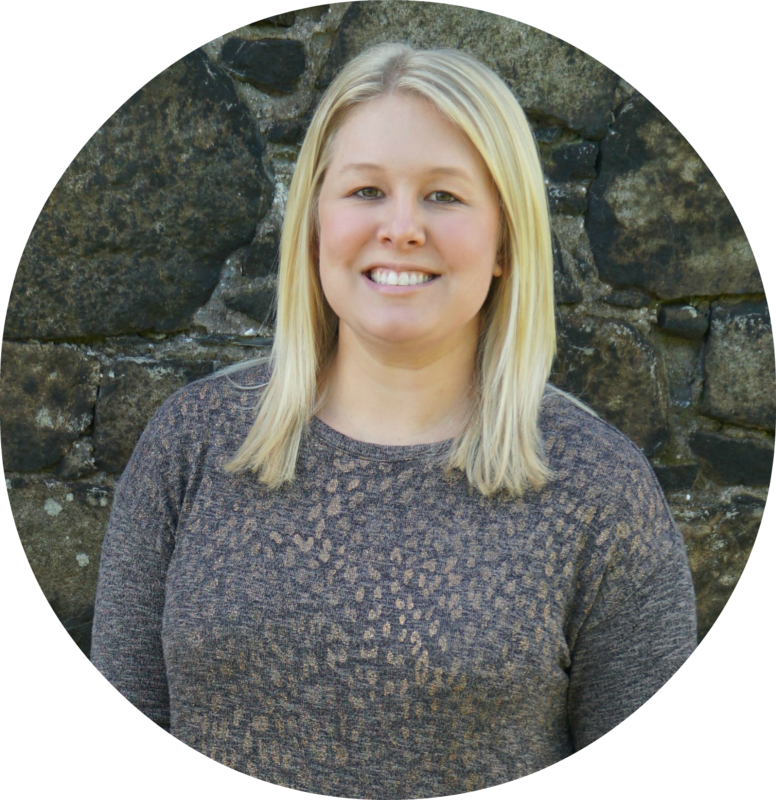 *If you are not planning to eat or gift the peppermint bark that day, bag everything up and leave it in the refrigerator overnight. MMMmmmmm, thanks for sharing Sam! Didn't think it was that easy to make these! 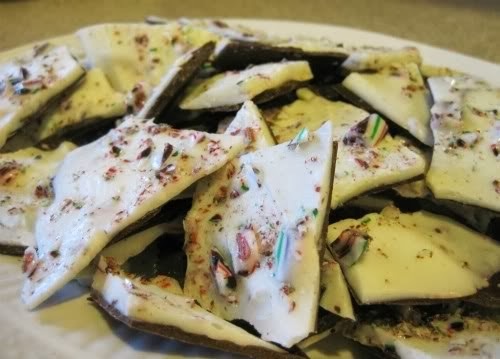 Oh, I love peppermint bark! I would love a bite of that bark! I've never seen the green candy canes before. Happy New Year! 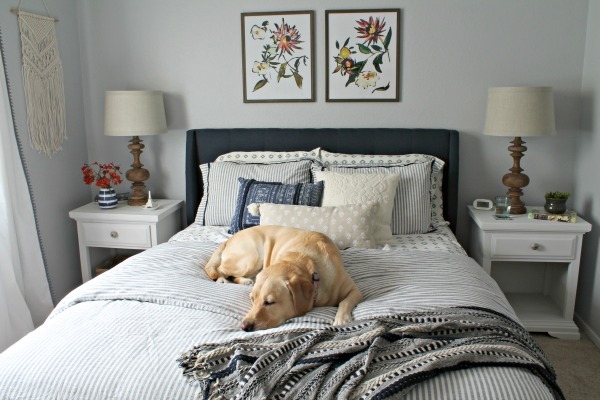 This looks so easy to do and often wondered if I could do it. Thanks for the recipe.